This spring, we're excited to sponsor (and attend!) the first-ever Ply Away Retreat in Kansas City, Missouri. As you may have guessed by the name, this retreat is being put on by the folks who publish PLY Magazine, a wonderful community-driven quarterly publication that's all about handspinning. Recently, PLY's Editor-in-Chief (and wearer of many hats, including event planning!) Jacey Boggs Faulkner took a few moments to give us a preview of the retreat. For more information, please visit www.plyaway.com. If you plan on attending the retreat, be sure to stop by the Woolery booth in the marketplace to say hello, we look forward to seeing you there! PLY Magazine is holding its first annual PLY Away retreat April 21, 22, 23, and 24, 2016 in Kansas City, MO at Crown Center’s Westin. We chose this location because it's near lots of great restaurants and attractions, yet still provides us with that tucked-away feeling of being at a private retreat with a cozy group of spinners and fiber folk. We're thrilled to welcome many esteemed teachers such as Beth Smith, Deb Robson, Jillian Moreno, and many more. Christina Pappas is consistently mentioned as our readers’ favorite writer and she’s so knowledgable. She’ll be combining her job as an archeologist and her love of spinning and teaching a half day class about Twist and Twine - how ancient yarn was made. It should be fascinating and one of those classes that’s fun and educational while kind of feeling like a break. We are welcoming two teachers from Canada, both regular teachers in the Old’s master spinning program (and there are still a few openings in their classes for those who dare!). Coleen Nimetz is teaching a Silk Tasting Class that will be amazing — all the different kinds and preparations of silk in 3 hours. If you’ve been wanting to experiment with silk, she’s the expert you want! Michelle Boyd, aka the most technical spinner we know, will be teaching 3 classes about twist, grist, and combing fiber on mini combs. Just being around her will make you a better spinner! As for the retreat in whole, all of the 2-day classes sold out very quickly, as did most of the 1-day classes. However, are a few spots remaining in the Technically Twisted class by Michelle (again, a mind-blower of a class) and just a few in Patsy Sue Zawistowski’s Illegal Yarns class, which is a great way to spend a day - breaking the rules of spinning and learning a ton each time you do. Downtown Kansas City, as seen from the Westin Crown Center. Imagine yourself spinning here! All of the classes are great: they were picked, curated, and built especially for our first ever PLY Away and correlate to the first 2 years of the magazine - and if you need a refresher on all of the amazing topics PLY has covered in that time, click here to check out our back issues. In short, these aren’t classes that will be offered next year - classes for Ply Away 2017 will be all new! If spinners want to come just for the weekend, there are enough half day spots open to accommodate a few more people, though we expect the number of available spots to decrease as the event draws near. Even if you don't plan on registering for any classes, you can still join in the fun by attending the free-for-all spin-in on Saturday night and the free-to-the-public marketplace from Thursday at noon to Saturday night! 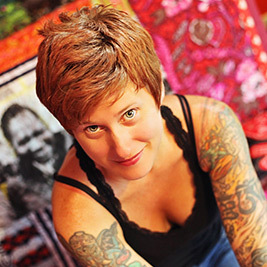 Jacey Boggs Faulkner has spent the last decade falling in love with fiber, writing a book (Spin Art, Interweave, 2012), writing for various fiber and spinning magazines, producing a spinning DVD (Sit & Spin, 2009, self), and teaching all over the world. She is the editor-in-chief of PLY Magazine, which is putting on the eagerly-anticipated Ply Away retreat this spring!